Review The world isn't exactly short of devices designed to get audio-visual content from your Nas box, USB stick or external hard drive and onto your telly. The trouble is, many of them are three-legged nags let down either by grim UIs, lacklustre codec support, cheap and nasty remote controls, a simple lack of expected functionality, or all the above. 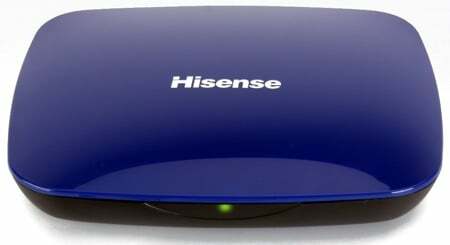 The latest media player to land of Register Hardware's desk comes from Hisense, a Chinese company we haven't encountered before and not a name to automatically moisten our nethers. In the UK, the unit is available exclusively from online retailer Expansys. The player is nicely understated bit of kit being little more than a shiny plastic box with a slightly domed top. At 210 x 170 x 32mm, it's small enough to be easily sited, and its 315g weight isn't going to strain whatever other bits of AV kit you sit it on. The unit itself is wholly devoid of controls and the only indication it is doing something is the standby/power LED that changes from red to green when the unit powers up. The unit is operated entirely with its remote control, which isn't a bad of kit either. It looks like an old-style Apple Remote with ideas above its station, but unlike the Mac-oriented model, it's not too small. The buttons are logically laid out and all the controls all have a pleasant action. Batteries, however, are not included so make sure you have a couple of AAAs to hand. For connectivity, the player has two powered USB ports and an 10/100Mb/s Ethernet socket. Happily the former have been given one whole side of the machine to themselves ensuring there is plenty of room to easily connect or disconnect two sticks or drives at a time, daft USB or cable connector designs notwithstanding. Along with the Ethernet socket, the other side of the device houses an HDMI port, component-video and stereo analogue jacks – both of which Hisense supply cables for – an S/PDIF digital audio port and the 12V power socket. Some CRT owners may bemoan the lack of a Scart connector, or composite-video, but with HDMI-equipped flat-panel TVs becoming ever more common it's not a deal breaker in our view.